WWE has their Elimination Chamber match coming up this Sunday and it looks like they’re not done tweaking the card. They already had to exchange Mustafa Ali for Kofi Kingston this week in the WWE Title Match and now they are adding a stipulation to another contest. Baron Corbin and Braun Strowman have been at war for a while now and it appears that they are not finished yet. 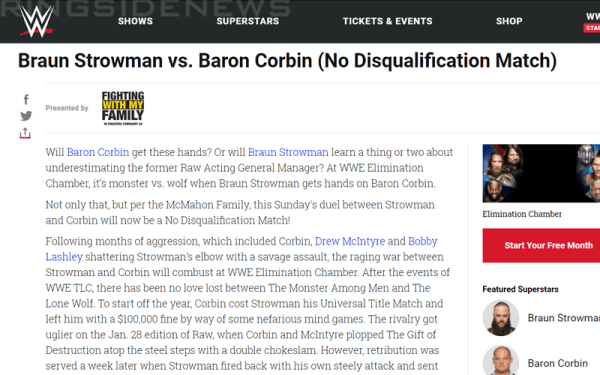 Elimination Chamber will see the two foes battle once more, but now WWE has added a No DQ stipulation. If you’re not a fan of No DQ anything then you’re not alone. Sometimes they are used because they have something else involved like a gimmick finish or a run-in, but some fans consider it lazy. It looks like anything goes between Baron Corbin and Braun Strowman so you can expect the unexpected. We will keep you updated on any other updates on the Elimination Chamber card that WWE might throw our way here at Ringside News.